I received my BJC IC's earlier today. I'm comparing them to my Monster M1000i's, M950i's and AudioQuest Corals. They seem better built than the AQ's but not as good as the Monsters which are thicker and heavier. I havent had a chance to AB them but they sound good. I can't tell any loss of detail. They possibly have tighter bass but not as pronounced. Treble may be a hint more pronounced. Or I could be hearing things. I'm going to give them about 20hrs break in for what ever thats worth, and then I will do and AB comparison. BR, check out this gen, I use it and it's great. Also available from this site are individual sounds and frequencies in MP3 format. You could DL a specific sound or frequency, burn it to disc and repeat it from a CDP. I have my comp integrated with my system so I just use the generator. Some pink noise should do the trick for you. Thanks Pops, I'll check it out! looking forward to your review Raven. Especially the BJC and the Monster. This stuff is fun. I just wanted to post so i could get an email when BR posts back I'd be surprised if the BJC is better than the AQ but you never know. Mr. P, I've never been that impressed with the AQ Corals. They don't seem that well made compared to the Monster cables or the BJC's. They are not as thick or heavy and the outer insulation does not appear to be as good quality, They sound ok but I think the Monster cables m1000i and 950i may produce slightly better bass. They came free with my Music Hall 25.2 cdp. So far the BJC's seem to bring the treble more forward for lack of a better description and sound stage my be slightly wider.. Bass seems tighter too but the bass also seems deeper with the Monsters. Now this is all very subjective. I need to get my audio buddy over here to do an AB comparison. I also have some 10g BJC speaker wire that i self terminated that I have yet to try. I've been using the 10g Monster Cable Z4's which list for $599. I paid $120 on ebay. The monster cable wire is extremely well made, well insulated an weighs a ton. Last edited by blackraven; 11-07-2009 at 02:28 PM. I have access to AQ locally but I've not been impressed with them either. Same priced Transparent were much better than the AQ. I just don't have respect for Monster and really thought the AQ might be better. It will certainly be interesting to see what the BJC do. One thing that impresses me about the BJC for the price is how good the midrange is. As you stated, and I in my review, BJC's build quality is excellent. Mr. P, I don't know if you have ever seen the upper level M series monster cables. But they are well made and a British review on the m1000i's was excellent. And besides, $30 for a $200 cable was too good to turn down, even if I despise over priced monster products. I have access to AQ locally but I've not been impressed with them either. I recently purchased AQ King Cobras and I am not impressed. At least not in my system. I have not decided what is wrong with the sound. Vocals are subdued and difficult to understand. I could not tell what Michelle Shocked was singing. I hated her new cd through the AQ's. I finally thought I need to try the Micropurls again and now I could understand everything she was singing. The AQ's sounded more open and extended in the highs but the midrange was congested. I do not know if this will make sense to anyone but they made it sound like more was going on in the music than there was. I like my AQ Slate speaker cables but must say no to the ICs. JM, our local Krell dealer used Transparent. If you're still looking you might give them an audition. Ok, I'm finally going to admit it! No! Wait! I can't! But I must. GASP! Ok, I'll say it. I can hear a slight difference with my BJC's over my Monster m950i's. There, I said it! The BJC's definitely have more forward treble and less but more controlled bass. Here's my take on cables. I think that they are system dependent. I have done blind comparison's before and found no difference comparing high end cables with cheap ones before and haven't noticed a difference. How did BJC compare to the AQ? The Monster must be worse than you thought if the BJC had more treble. They aren't bad but when compared to Transparent you could tell the treble was subdued. Only the m950i seemed to have slightly rolled off treble, the m1000i did not. The AQ's had less air and detail. The 2 monster cables sounded warmer and more prominent midrange and bass but the overall sound of the BJC's was more balanced. I'm currently using the cheapest of cheapest interconnects as the ones I was using went into my parents system back home. I'm looking at BJC as they also have a UK website (and aren't ripping me off on the exchange rate for once). Which BJC interconnect would you guys recommend and also, can the techflex sleeve be taken off/put back on? What I like about Blue Jeans site is they give you a lot of minimal-BS information. E.g. 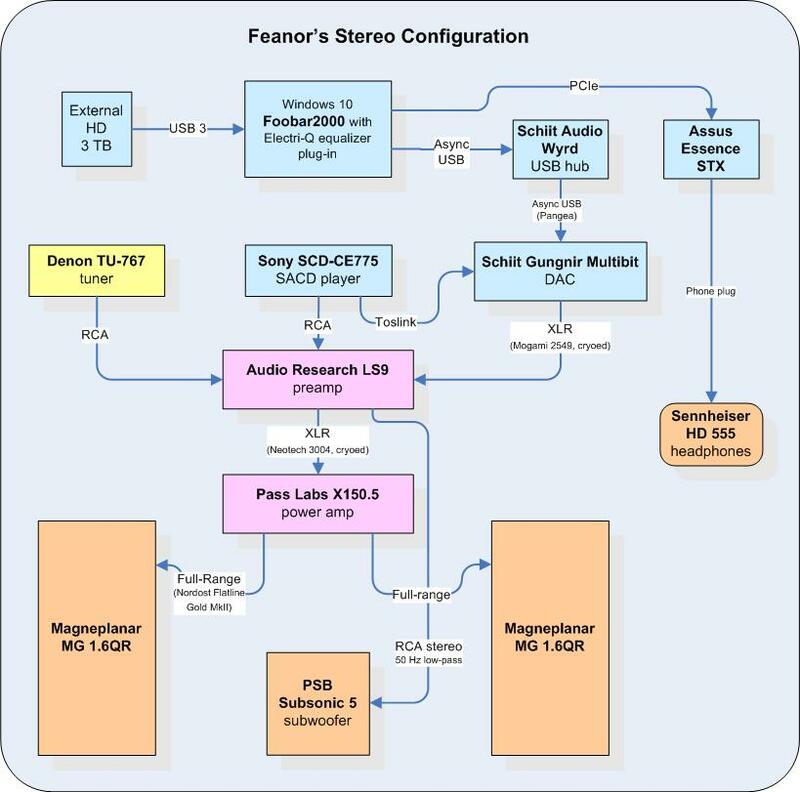 look at their UK Stereo Audio page: here. Basically for interconnects they recommend their LC-1 low capacitance cable, or if you have potential RFI problems from say, proximinty to computers, mobile phones, or other wireless devices, then Belden 1694A. Thanks Bill, indeed I have paid the website a visit but I must admit they are not very clear with the info they give on each interconnect. Is the 1964A a lot worse than the LC-1 aside the RFI rejectability? How about the LC-1's rejectibility of RFI? Is it quite bad? Oh, and any idea about the jacket? True, true, not enough quantitative measurements. Don't know about the Techflex, I've never ordered it. My guess would be you can't swap it between sets of cables because it's too snug to get it past the connectors on the ends of the cables. I use the LC's and have not had issues with any interference. The jacket is not removable. I have pointed that out in the past to those who suggest that LCR metrics are all that matter. Remember our ex-Motorola engineer FLZapped? Here's the standard position from those with limited experience who use speculation as their guiding principle. Really smart people know what they don't know. I do because my one meter set has it. It is a cosmetic only enhancement. Unlike when I employed it on a DIY 83803 based power cord using tight heat shrinkable boots, it is implemented as a loose jacket with about four inches of total free space between it and the connectors. You can slide it one way or another (or remove the cables altogether one leg at at time) to facilitate connector spacing. Which is a good thing for my application between a Bellari phono preamp and a Threshold amp. While the connectors on the Bellari are only an inch apart, it is more like six inches on the Stasis. So you're saying the techflex jackets are removable? But you had to cut 'em no? which means they can't be re-used? What kind of length are those cables? No! Go back to my original post. One normally finds Techflex implemented on a per cable basis with the ends sealed using heat shrinkable jackets. That is how I used it with a power cable I assembled. That's not what Blue Jeans does at all with LC-1. They take two cables and put them both in a loose jacket of Techflex that is about four inches shorter than the cables themselves. After taking the pic, I put the other cable back into the sleeve. One meter length. I traded for my LC's and they did not have the flex stuff on them, I misunderstood what you were asking.